Flags of Our Fathers is one of those WWII films that leaves you thinking about it for days and days afterwards. I suppose it's the stories of the men and women who were just and you and I, and braved the horrors of war and lived their lifetime with the nightmares. 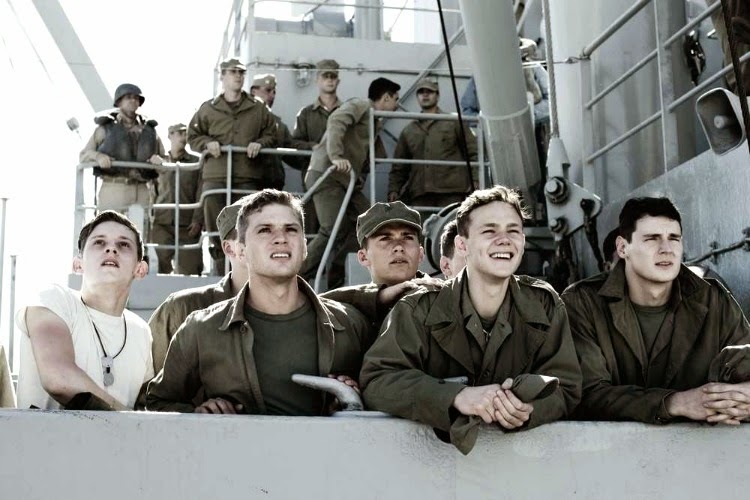 Based on a book by James Bradley and Ron Powers, it retells the story about the battle of Iwo Jima, the five Marines and one Navy Corpsman who were involved in raising the flag on Iwo Jima, and the aftereffects of that event on their lives. The film is scene through the American perspective and is seen mainly through the eyes of the Navy Corpsman, John Bradley, who was the father of one of the authors. I have always been intrigued by the men who raised the flag and I know many believe the flag raising was staged. 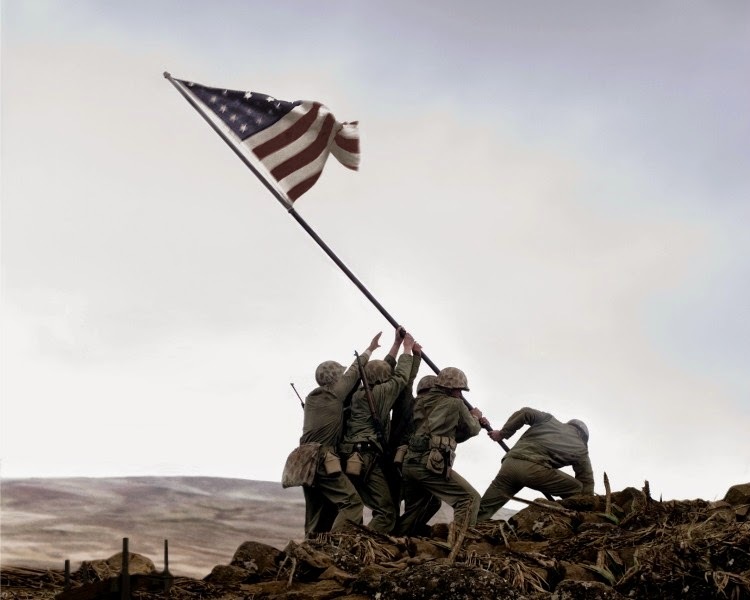 It seems after the first flag was raised that some politician wanted to own that flag and the commander in charge refused for that to happen so he had another set of men raise another flag and that is when the iconic photo was taken. You can read more about the iconic photo HERE. The film is set with flashbacks that for a moment confused me but by golly, it is what made this film really shine. You get involved with each character and better still is has an air of real story telling happening. I loved it! I don't feel like it was over dramatized as many war films are over dramatized to attempt to convey a message of heroism. This film just told the story of these boys and what happened to them. 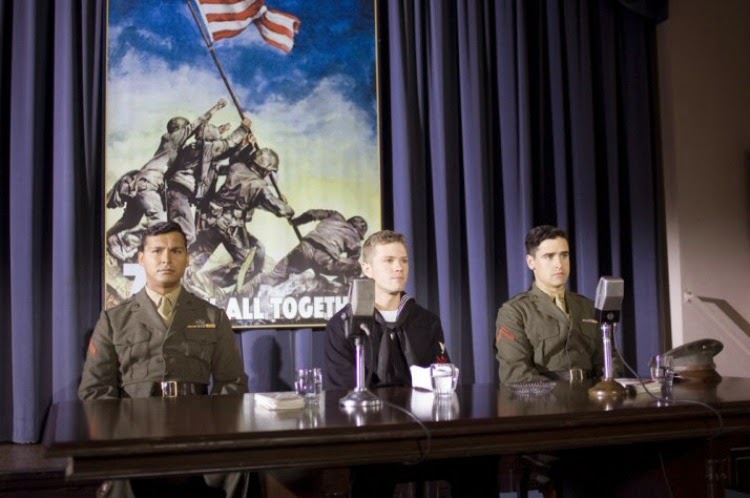 It stars Ryan Phillippe as John Bradley (the Corpsman), Jesse Bradford as Rene Gagnon, and Adam Beach as Ira Hayes. All three men were the last surviving men who raised the flag and were asked to go on tour to help raise war bonds to help supply the last remaining soldiers who were still fighting the war. It is a must-see for those interested in learning more about WWII. Seeing things from the perspective of the men involved was eye opening and humbling at the same time. I now really want to read the book. I can only imagine how informative, inspirational, and engrossing it could be. Have you seen this film or read the book? Did you know much about the boys who raised the flag at Iwo Jima? And, a great, empowering quote. So true: there are no heroes out there, just regular people in an irregular and extreme situations. That makes them magnificent. That quote sends shivers down one's back in a way, doesn't it? I can't help but think of some of my relatives who found in WW2 (one of whom didn't make it home alive) and how their loved ones must have viewed them.